The Luxury Watch Corner is Perrelet North America's official blog. Find Perrelet news and recent press, luxury industry related news and events, and Perrelet's retailer information. Known to laymen as the “stopwatch” feature, this time measuring tool is not only useful but superbly stylish. 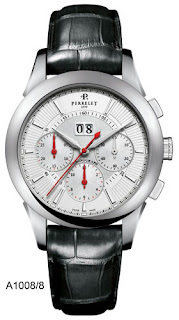 Perrelet has captured the dual nature of the chronograph new for 2010, ready for action Chronograph Big Date watch collection – in steel or titanium. A redesigned case, with an impeccable profile and curve,the “Diamond Flower” collection combines materials and perpetuates the charm of unique technology. 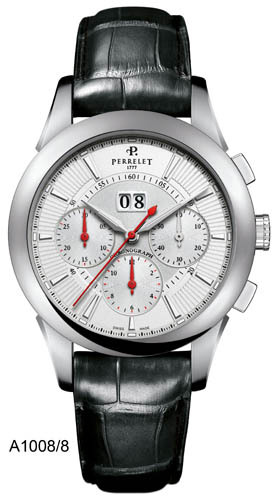 Very chic, the new Perrelet design is surprisingly radiant. Its ceramic case, either profoundly black or immaculately white, overlaid with a diamond-set bezel, embodies elegance and perfect harmony. Contemporary and lightweight, the “Titanium” collection by Perrelet comes back to center stage. The superior features of this amazing collection are highlighted in our symbolic “Double Rotor”, the “Moon Phase and the “Retrograde Regulator”. All of which incorporate the remarkable and unique Perrelet finish and the central rotor set with crystal. Today, the collection has been extended with new dials and a sporty “3 hands-date” model. 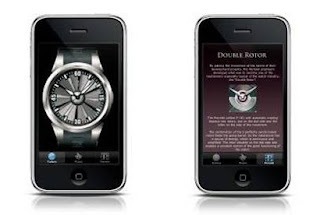 Perrelet launches their first iPhone app: the Double Rotor iPhone App. The app simulates the movements and attributes of two of Perrelet’s most intriguing watches: the Turbine and the Diamond Flower watch. And as you can expect from a watch: it also indicates time! The app is fun and FREE and available at the app store. Perrelet's Turbine Watch Video - Inspired from the field of aeronautics, our engineers and watch designers have created a new adaptation of the Perrelet patent, the "Double Rotor". 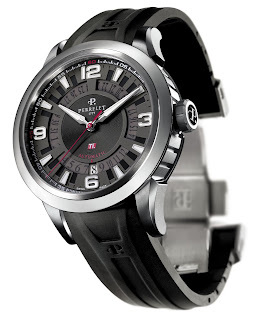 The Turbine Watch fitted with 12 blades made of titanium, covers the dial and slips beneath an interior black bezel. On the under dial, markers accentuate the optical effect and make the impact of this model all the more sensational. Just like a jet engine. 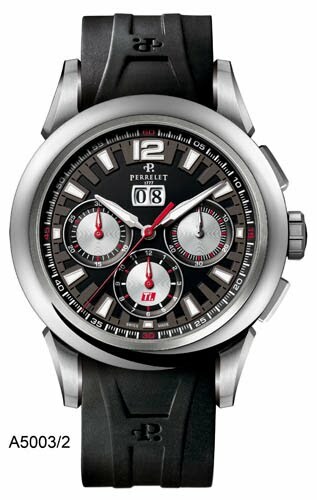 Perrelet will be attending Basel World 2010. To make an appointment with Michael Goldstein of Perrelet USA please call 954-575-7980. See you there! With a New Decade here and Valentine’s Day around the corner, discover or re-discover our Prestige Edition of the Diamond Flower collection. 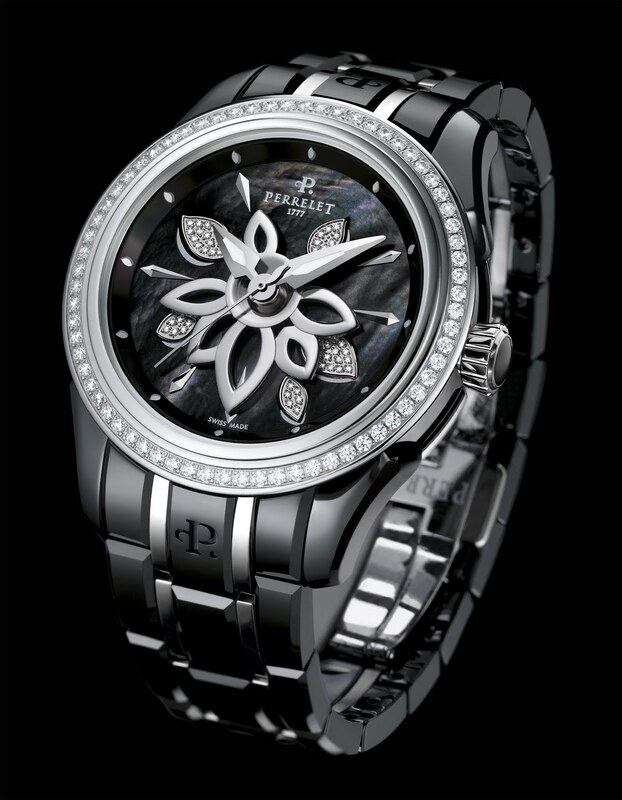 The Diamond Flower is a combination of refined watch-making and jewelry art, in which the Double Rotor bears a feminine touch. It is inspired by a finely sculpted lotus flower, set with precious stones while providing the unique charm of sparkling technical elegance. The spirit of this collection is on the move, as we will be presenting a preview of the new Diamond Flower duo in black and white ceramic at the upcoming Basel World, from the 18th to 25th of March 2010. Paul Sorvino recently held a press conference for the launch of his new pasta sauce line. He did it in style by wearing his favorite Perrelet watch, (The Skeleton Chrono) at the prestigious Friar's Club in New York City. Perrelet, inventor of the first automatic watch, North America is lead by me, Michael Goldstein, Managing Director. I have Worked with high end brands for the past 15 years, including Hublot and Audemars Piguet and my background and experience is perfectly suited to bring Perrelet to it's rightful place among the great watch brands of the world.